Quality. Value. Fun. The three cornerstones of our bike rental fleet. Choose from our great selection of rental options to find the bike that best suits your needs. Suitable For: Sport/Leisure off road riding. Blue/Red Trails. Skills Park. General trail riding. Shorter travel full suspension mountain bike. Front and Rear air suspension, with 120-130mm of travel. 2 x 10 gearing, powerful hydraulic disc brakes. 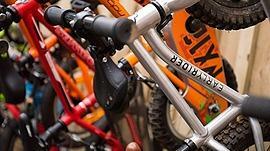 We use Merida One-Twenty 400 bikes. High End Full Suspension mountain bikes to demo and rent, some of the best bikes on the market. Compare suspension travel, groupsets, wheel sizes, tyre choices. Orange, Saracen, Nukeproof and Merida. Suitable For: Technical Trails, Red/Black trails, Skills Park, Natural Riding. Racing. Exlpore far and wide on our range of gravel/adventure bikes. These are really versatile machines, happy on tarmac and on gravel tracks or forest roads. We use Genesis Croix De Fer 10s, which have steel frames and 20 gears. Take one for the day, who knows where you will end up! Our Tandem is a versatile all rounder, with 700c Wheels, wide tyres, flat bars and enough gears to keep you moving up the steeper hills. Powerful disc brakes keep the speed sensible. All you need to do is find a riding partner. Size medium only. "We went camping to Comrie Croft. The kids saw all the bike tracks and were eager to get on, so we popped down to hire a few bikes. Excellent staff and bikes, reasonable price and kids loved the tracks"